With fresh components, a touch layer, and a much-improved stand, Dell’s XPS 27 is the best Windows-based AiO we’ve seen. 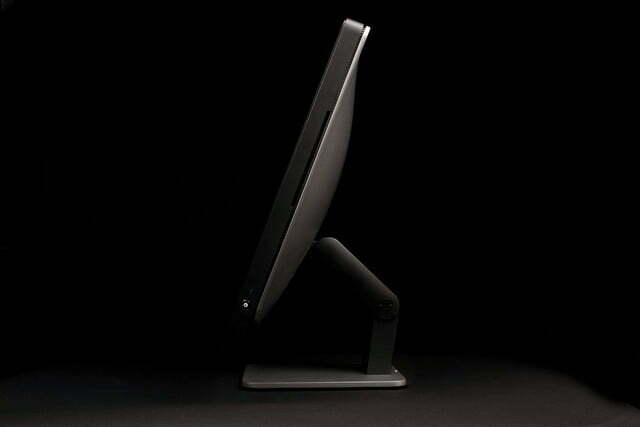 With a starting price less than Apple’s competing offering, it may gain some iMac converts. Plenty of consumer devices get labeled as Apple clones – some fairly, and some unfairly. But it’s surprising how few products that bear that epithet actually wind up being great. You’d think taking cues from hugely successful products would be a shortcut to success. The XPS 27 Touch is easily the strongest competitor to the 27-inch iMac that we’ve ever seen, with good looks and very good performance. But too often, an Apple-like silver shell and a sleek, slim profile wind up covering up lazy engineering and sub-standard components. But Dell’s XPS 27, while it undoubtedly resembles the 27-inch iMac at first glance, arguably bests Apple’s current iMac in several ways, adding a responsive touchscreen, a more adjustable base, and an optional Blu-ray drive. Apple, meanwhile, seems to mostly be chasing the diminishing returns of ever-thinning aesthetics with its latest update to the iMac line. In this update, the XPS 27 Touch, Dell hasn’t messed much with the looks of the system since we first spent time with it in 2012 when it was called the XPS One 27 (and still ran Windows 7). Instead, Dell dropped the “One” from the product’s name, added a touch layer, packing in some fresh Intel Haswell and Nvidia 700-series internals. But the new features mean a steeper starting price of $1,600 (and a cringe-worthy $2,100 asking price in our review configuration). So, a year after we reviewed the original XPS 27, with the same excellent 2,560 x 1,440 display and new internal components, does the updated version still shine? 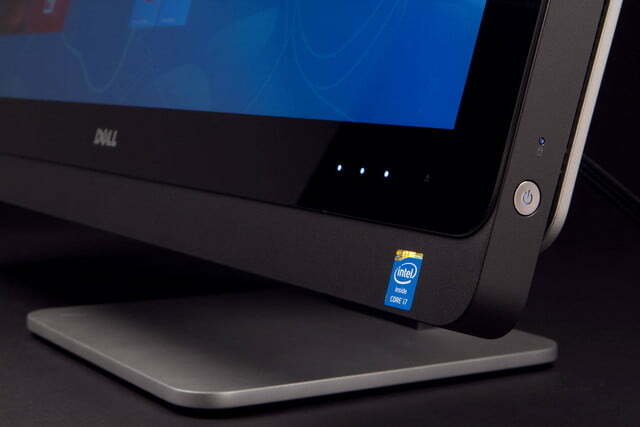 The main design difference between the initial model of the XPS One 27 and the newer XPS 27 Touch is the stand, which Dell altered to better accommodate touchscreen input. 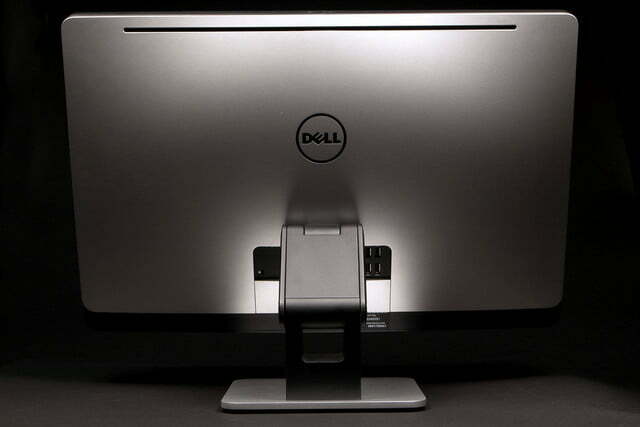 Dell replaced the system’s rigid silver arm, which only offered tilt adjustment, with a black, dual-hinge arm. 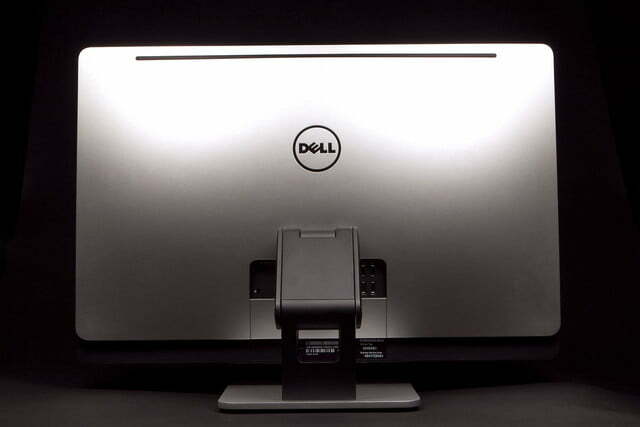 This lets you transform the XPS 27 from a reclined, touch-friendly system that’s less than a foot tall, to a fully upright device that stands about 19 inches high and is better for watching video or tackling most productivity tasks. The heft of the system, which packs its potent components behind the screen, means you’ll likely need both hands to adjust the screen’s angle. 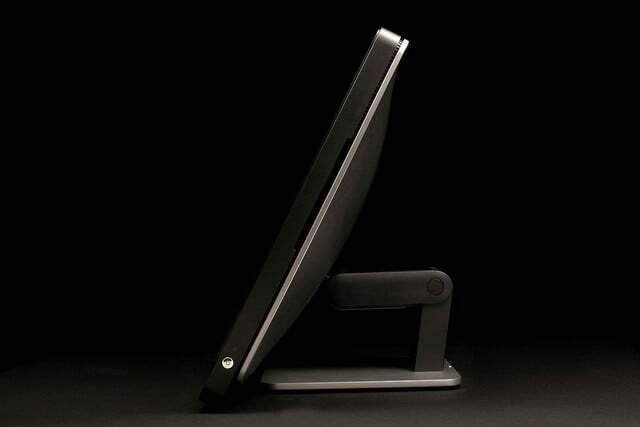 But for the most part, the hinge works well, and makes for a much more versatile computing experience. That being said, the screen does wobble a bit when tapped with a bit of force. And you’ll need to keep the space in front of the screen clear of clutter, as the front of the screen slides forward a few inches when it reclines. 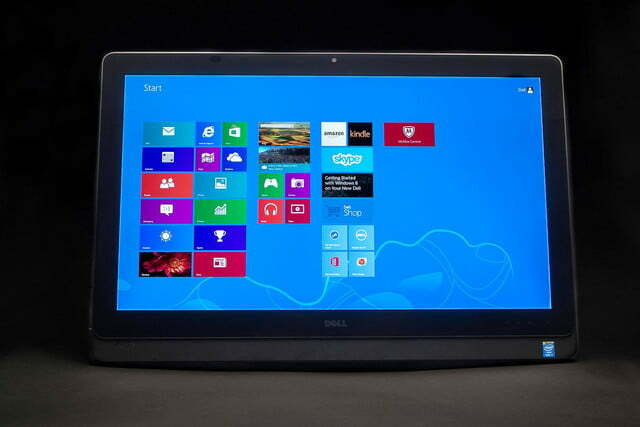 Other than that, the XPS 27 Touch is the same attractive system on the outside that we mostly liked last year. The glass-covered screen, with a protruding lower section that houses downward-firing speakers, dominates the front. The speakers are quite loud, with a nice helping of low-end thump. Distortion becomes an issue at maximum volume, but leaving the volume at about 70 percent nicely fills a medium-sized room with sound, so that’s not a major issue. The silver base is metal, but the system’s backside is still plastic, with a bit more flex than we’d like. 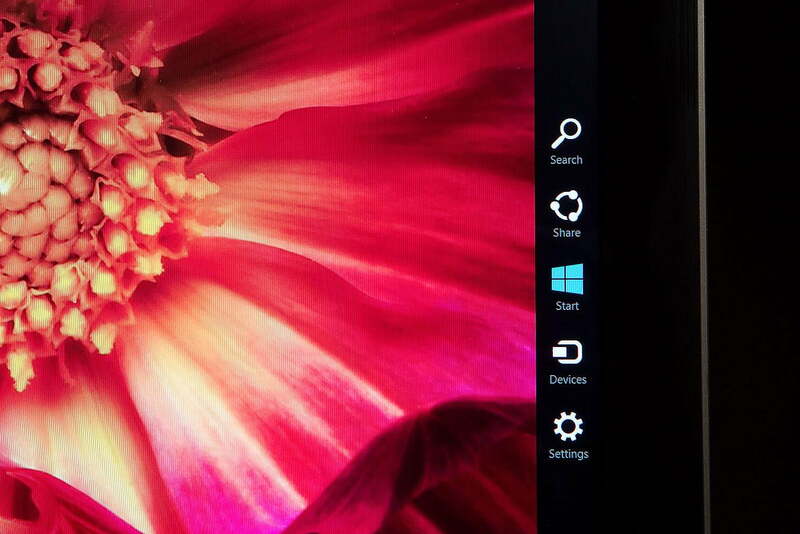 This is the one area where the XPS 27 doesn’t quite feel like a premium machine. But it is, after all, the back of the system, so it’s not all that noticeable. Much of the XPS 27 Touch’s connectivity features are identical to the previous model. You get six USB 3.0 ports, two of which sit on the left edge along with the headphone and mic jacks, and the SD card slot. Four more USB 3.0 ports are around back and are joined by an Ethernet jack and a pair of HDMI ports. One HDMI port lets you add a second screen to the XPS 27, while the other lets you use the system’s screen with a Cable box, game console, or another PC. These ports help make the system an excellent dorm companion if space is tight, as you really won’t need a separate TV. Two HDMI ports help make the system an excellent dorm companion if space is tight, as you really won’t need a separate TV. 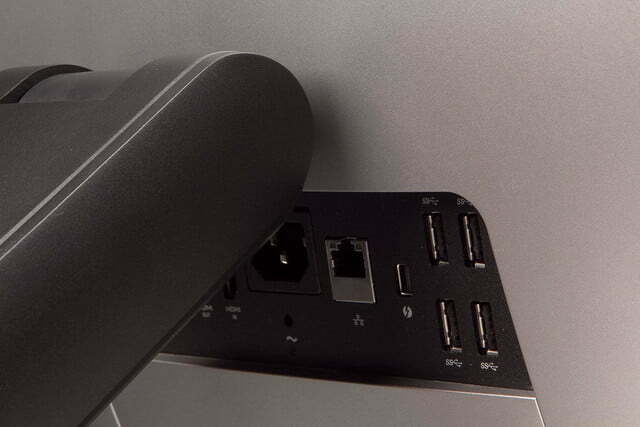 There’s also a Thunderbolt port on the back of the updated model. That might not mean much in the short term, as Thunderbolt-enabled products have been slow to take off, especially in the PC space, but Thunderbolt is very fast and versatile. With both Intel and Apple heavily behind it, it seems clear that the Thunderbolt interface isn’t going anywhere. 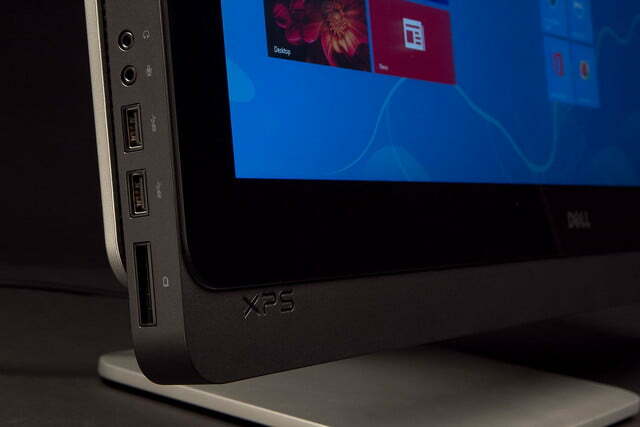 So, the XPS 27 Touch’s Thunderbolt port may come in handy down the road for adding additional features. 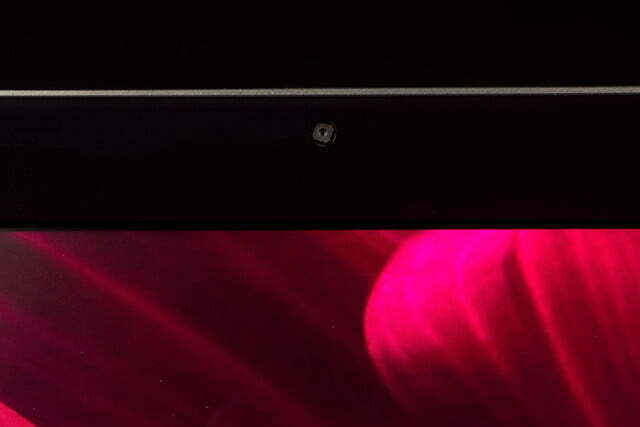 There’s also a slot-loading optical drive on the right edge of the system. Our review unit came with only a DVD, and a Blu-ray drive is an optional upgrade that you can only get if you step up to the $2,600 top-end model. That version also doubles the RAM (to 16GB) and steps up to Windows 8 Pro. But those are added features that most will find unnecessary. We’d suggest most users stick to the lesser configurations and either stream HD content, or connect an inexpensive standalone Blu-ray player to the aforementioned HDMI port. 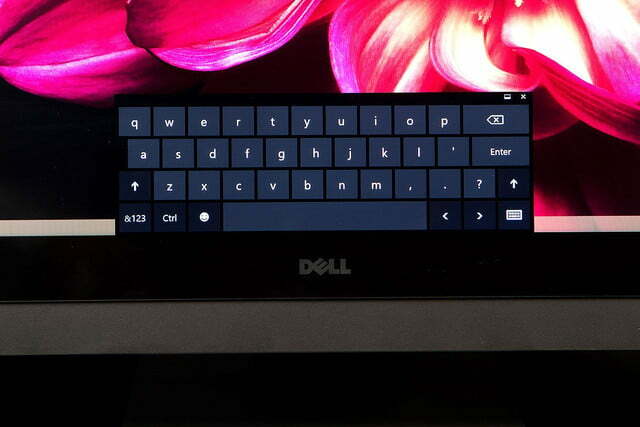 Just as we saw last year, Dell offers up a great display with the XPS 27 Touch. Its 2,560 x 1,440 resolution matches that of the similarly sized iMac – great for multi-monitor-like productivity without the clutter of extra screens. The addition of a touch layer is certainly appreciated with the update to Windows 8, and the reclining screen helps alleviate some of the arm fatigue of tapping and swiping around the large 27-inch screen. Still, because of the high resolution, many buttons and menu items on the Desktop side will be difficult to select with your fingers, so you’ll always want to keep the keyboard and mouse handy. Photo editors and those who otherwise value screen accuracy will find a lot to like with the panel performance here. In our tests, the XPS 27 Touch rendered a full 100 percent of the sRGB and AdobeRGB scales and delivered solid black level performance. It’s also the brightest PC screen we’ve seen since HP’s ElitePad 900, topping out at 372.7 nits (the ElitePad 900 topped out at 412.7). However, as we’ve seen with pretty much every recent touch-enabled PC, the glass and touch layer atop the LCD means that there are glare and reflection issues. Cranking up the brightness does help the issue somewhat. There are better-performing professional standalone monitors, but for a consumer-focused system, the screen in the XPS 27 Touch is superb. Often, even on high-end systems, companies ship low-grade peripherals in the box, which force you to go out and spend more on a decent keyboard and mouse. But that’s not the case here. The wireless pair that Dell includes with the XPS 27 is pretty darn good. The keyboard is a moderate size, with textured keys and a number pad. The mouse sports a squarish, ambidextrous design that’s comfortable in hand, while offering up a scroll wheel and a pair of side buttons. 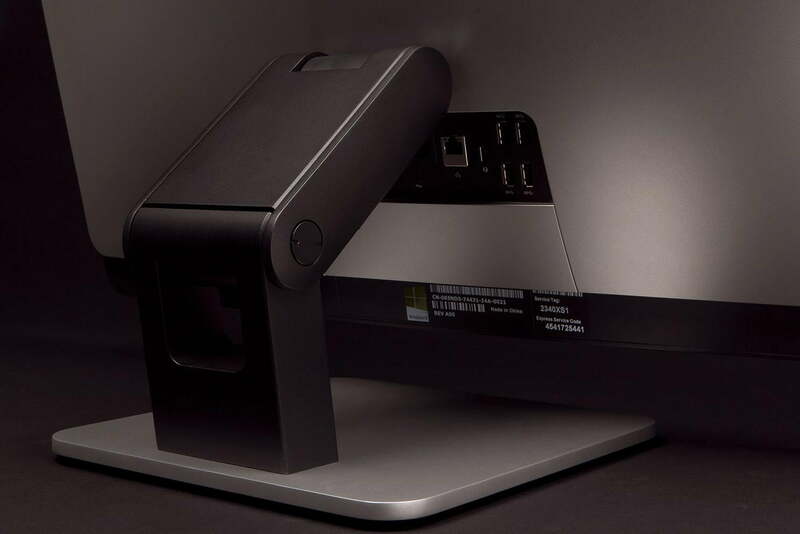 Both peripherals have a silver ring around their edges, pairing them aesthetically, both with each other and with the silver base of the system itself. As we saw with the original XPS 27, Dell has opted for the low-voltage “S” version of Intel’s highest-end mainstream desktop processor in our review configuration, due to thermal and space limitations inside the system’s slim form factor. This time, the XPS 27 gets a 4th Generation (Haswell) Core i7-4770S CPU. Combined with the 8GB of RAM and a 2TB hard drive paired with 32GB of solid-state cache storage, the system has no problem performing tough productivity tasks and media crunching. 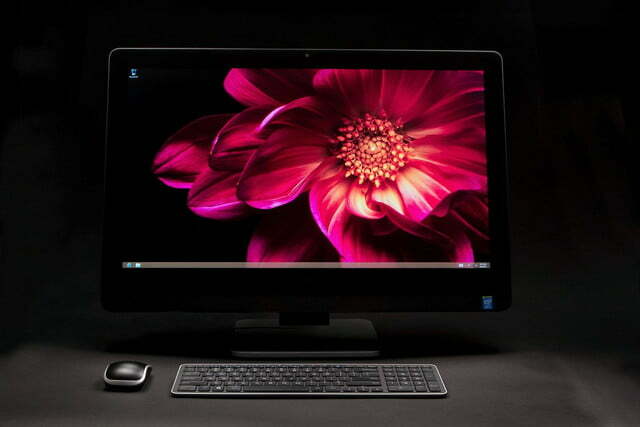 However, it doesn’t perform as well as the company’s XPS 8700 tower, with its standard, non-“S” model Core i7-4770 chip. On our SiSoft Sandra Processor Arithmetic benchmark, the XPS 27 managed a score of 100.36, while the XPS 8700 tower managed a score of 109. The scores were both slightly in favor of the XPS tower over the XPS 27 in our 7-Zip benchmark. But the XPS 27 is still a powerhouse productivity machine compared to most modern PCs. Its scores on these tests are about three times what the average Ultrabook can muster. When it comes to gaming performance, though, things aren’t so impressive for the XPS 27 Touch. The Nvidia GT 750M graphics chip in the machine is fairly new, but it’s also a mid-range, mobile-class chip, rather than a desktop card, which are generally much more powerful. As a result, the XPS 27 managed a respectable score of 1768 on our 3DMark Firestrike benchmark. But the XPS 8700 tower with its desktop graphics, managed to more than double that, with a score of 3957 on the same test. What that means in terms of gaming performance is that you’ll be able to play modern demanding games, but generally not at the system’s native screen resolution or at the highest settings. If you want to game without visual compromises, there’s still no better choice than a desktop tower like Dell’s XPS 8700. But while the XPS 27 Touch doesn’t quite deliver dedicated gaming rig-class performance, it also doesn’t suffer from the loud fans of those high-end systems. In fact, we had trouble coaxing the system’s fans to register at all on our sound meter. At both idle and at full CPU load, we didn’t get a reading above the 40-decibel baseline. It was only when maxing out the graphics core using FurMark that we recorded a reading of 43.2 decibels. 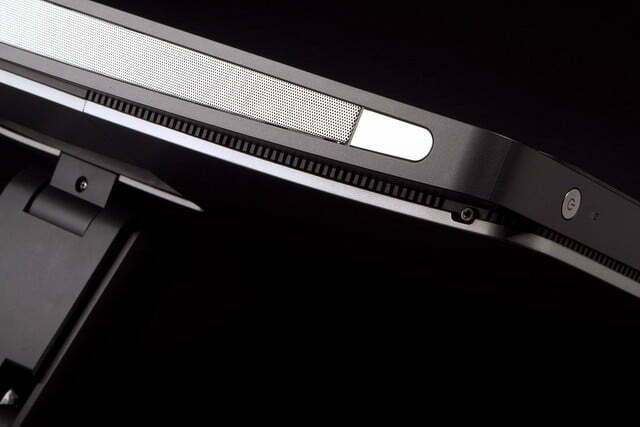 Considering its internal components and relatively slim profile, the XPS 27 Touch is a very quiet operator. With the addition of touch, a more flexible stand, and fresh new components, combined with the already excellent screen, Dell’s update moves well beyond Apple Clone territory. The XPS 27 Touch is easily the strongest competitor to the 27-inch iMac that we’ve ever seen, with good looks and very good performance. Sure, it doesn’t have the super-slim tapered edges of the current-generation iMacs, and its plastic backside and arm don’t look or feel as premium as Apple’s aluminum aesthetic. But Dell’s system still looks darn good, and packs a $1,600 starting price that’s $200 less than the lowest-priced current 27-inch iMac. 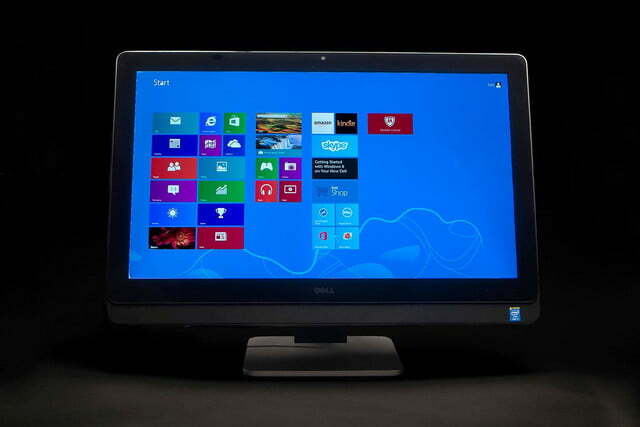 If you’re a Mac diehard, we won’t try to convince you to switch to the XPS 27 Touch. But if you’re OS-agnostic and looking for a fairly powerful large-screen all-in-one system, Dell’s offering is arguably a better value than the 27-inch iMac with more features and a more versatile screen. And while the XPS 27’s plastic backside may be a bit flimsy, it also pops off with a couple of screws to reveal easily accessible, mostly standard components. Apple, meanwhile, seems content to keep making iMacs harder and harder to upgrade or repair. The thinnest profile isn’t always great if it means you have to pay extra and lug your PC to a store to do something as simple as swap out a stick of faulty RAM.